Confessions of a Swiss Army Knife Collector, Part 2. Implements, All-time Favorites, and Modding. Welcome to Part 2 of a two-part post on Swiss Army Knives -- why I like them so much, how they tend to accumulate, and what makes them so interesting, especially to watch collectors. If you arrived here from somewhere else, you may want to go back and read Part 1 first. On the other hand, there's no reason you can't start here and read Part 1 later, so let's get started here with a discussion of implements, and then this post will wend its way to the Alox VSAKs and my own limited experience with modding. Implements & The 95% Rule. Perhaps unsurprisingly, it turns out that I have some pretty strongly-held opinions on SAK implements and what combination of them makes the perfect Swiss Army Knife. If you think about the universe of implements out there, the vast majority fall into the gee-whiz category. Sure, fish scalers, hooks, and wood chisels might occasionally be useful or even just fun to use, but without a doubt, 95% of my use of an everyday carry SAK is covered by the knife blade, the bottle opener, and the scissors. We will return to this exact combination later, but first I want to discuss some of the tools that fit into the remaining 5% of my use, because they're just cool. No frills. Two custom Voyageurs, a 93 mm (silver) and an 84 mm (orange), both perfectly illustrative of the 95% Rule. The Watch Strap Changing Tool. You may consider yourself to have basic competence when it comes to SAK implements. I mean, they all have a knife blade and bottle opener, and some have scissors, so what's not to know, right? Well, dear reader, did you know that Victorinox actually made an implement for the watch and strap enthusiast? Yes, there are actually two rare variants of the Classic that are equipped with a watch strap changing tool instead of the too-small-to-be-useful screwdriver. How cool is that? And the even-better news is that if you watch eBay carefully you may still be able to find one of these new. A rare Victorinox Classic with watch strap changing implement. The In-line Phillips Head Screwdriver. Many, if not most, of Victorinox's popular EDC knives utilize a Phillips head screwdriver that is installed on the back side of the knife, which means it's at 90 degrees to the knife in its deployed position. This makes it a little harder to use, in my opinion at least. The solution to this problem is the in-line Phillips head screw driver, but it appears on relatively few EDC-friendly knives. Perhaps my favorite is the Scientist -- more on this model later. A Victorinox Scientist, one of the few EDC-able VSAKs to feature the in-line Phillips head screwdriver. It's probably the most cliché implement on the Swiss Army Knife, but I confess I really like the corkscrew. It's one of the tools that Victorinox included on the original Officer's Knife way back in 1897, and I still use one often. With just a little technique, you can lever the knife body back against the bottle and multiply your mechanical advantage. I have never been defeated by a corked bottle yet when armed with this simple tool, but I have seen hundred-and-fifty-dollar, super-duper, new-fangled wine openers fail at this, their only task. Collectors will note that the earliest Victorinox corkscrews were made from grooved stock and were formed in five turns. Later, the five-turn screw went to four, and then eventually the grooved stock was dropped in favor of a smooth wire. It's these little details that help collectors of vintage VSAKs determine the age of their knives. Clockwise from left, a Scientist, Golfer, and Compact all feature a corkscrew in addition to their main tools. I don't know if it's apocryphal or not, but I've heard that the fine screwdriver was a customer suggestion given to Victorinox. Regardless, this little gem of a tool is a brilliant addition to any corkscrewed VSAK. It lives in the corkscrew and is completely out of the way until you need it. They're also easily modifiable with a little emory paper if you have an even tinier screw that needs adjusting. In fact, this little tool is so useful that a person could argue that the corkscrew is really just there to store the fine screwdriver. Especially in this day and age of the screw cap wine bottle, the corkscrew's intended use is limited; but here we have an extremely clever use for it -- as the docking and storage station for the fine screwdriver. Brilliant. The fine screwdriver in older (smooth, round) and current (faceted) form. Also seen stored in the corkscrew of the Compact. At some more recent point in the history of the VSAK, Victorinox introduced what are known as "plus" scales. Where a toothpick and tweezers have been included for at least 50 years, the plus scales add a ball point pen and straight pin. It's simply so ingenious and clever and well-why-not? that it must be included in my list of the 5% implements, even if their use is rare. A popular modification is to remove the standard scales of a VSAK and replace them with the plus scales. I did this for my own son's Tinker recently. Victorinox's brilliant stainless steel straight pin and ballpoint pen scale tools. My Favorite Models of All Time. Up above I referred to what I consider the 95% Tools: knife blade, bottle opener, scissors. I refer to them this way because I've been using and accumulating SAKs for over four decades now, and for about thirty of those years I've been convinced that 95% of my pocket tool needs are covered by these three tools. For this precise reason, a person looking to either start a collection of VSAKs or just pick one up for EDC purposes could do a lot worse than to seek out excellent specimens of the Victorinox Golfer, Voyageur, or Compact, which are some of my all-time favorite models. However, depending on your own individual 95% Rule, you may get more use out of an in-line Phillips head screwdriver, in which case I'd recommend the Scientist or Yeoman. In the Alox world, the Cadet is also on my list of all-time favorite models, and is delightful to collect in its many color variations. If you put a knife blade, bottle opener, and scissors together with a corkscrew in an 84 mm package, you get the classic Golfer. I bought one of these in a shop in Switzerland in 1988 and couldn't believe how useful it was. The 84 mm size really has to be tried to believe how comfortable and easy it is to carry. I found out many years later that Victorinox had in the past produced this exact combination of tools in an Alox-scaled knife and called it the Voyageur. There are no corkscrew or toothpick/tweezers on the Voyageur, but what you gain for this sacrifice is an even more slender package. Both of these knives are rare and collectible today. If I had bought a red-scaled Voyageur on that day in 1988 I could sell it today for over $1,000. Fortunately, good Golfers go for only $50-$80, and decent silver-scaled Voyageurs are only a little less affordable at 3-4 times that. Golfer (top) and silver Alox Voyageur. Both are 84 mm of pocket tool perfection. The Golfer eventually grew into a 91 mm knife and bifurcated into two models. One retained the Golfer name and sprouted a divot repair tool, making it finally worthy of its name I suppose. Unless you are an actual golfer yourself, the divot repair tool is definitely outside of the 95% Rule, but thankfully the original Golfer also co-evolved into the 91 mm Compact when Victorinox added the multi-purpose hook and plus scales to it. I own two Compacts and have gone through long periods of time when one was my EDC tool. It is still produced by Victorinox today and sells brand new for around 40 bucks. The Victorinox Compact in two Cellidor scale colors. If I could only own one VSAK, this would be it. Victorinox Scientist (top) and Yeoman. Identical but for the scissors. For reasons known only to the SAK gods (and probably Victorinox -- wait, those are the same), 84 mm models with scissors were discontinued long ago. This is unfortunate if you like scissors and also enjoy the extremely pocket-friendly 84 mm size VSAK. If you can't find or don't want to spend what it takes to get a good Voyageur, I would always recommend a Cadet, which is an Alox-scaled 84 mm knife with knife blade, nail tool, bottle opener, and can opener. These knives are so comfortable and pocket-friendly that it's worth losing out on the scissors and scale tools (toothpick, tweezers, etc), especially if you are able to conveniently store a Compact somewhere nearby, like your glove box or desk drawer. Even bought brand new, your investment in these two VSAKs, which would see you through 99.9% of your pocket tool needs, would run you less than 100 dollars. The Victorinox Cadet is available in Alox (shown) and Cellidor. Pocket perfection for the SAK minimalist. The Cadet is my favorite Alox knife in current production, and the Voyageur my favorite vintage Alox, but there are zillions of other Alox models out there available to the collector. It's such a large topic that I'll be leaving it for a future blog post, but I do have one other very special Alox SAK that I want to share with you. Regular readers will know that I'm somewhat of an LL Bean freak; my fondness for their Field Watch was the start of what turned into the Confusing Fall Warblers, after all. Imagine my delight when I stumbled upon a mint-in-box Wenger Standard Issue SAK, as sold by LL Bean in the 1980's when they cost $15.50. A clone of the Victorinox Soldier (and today's Pioneer), they were built to a heavier-duty spec than the Officer's Knives, so they will last a lifetime, even with daily use and abuse. The Wenger Standard Issue Soldier's knife as sold by LL Bean in the 1970's-80's. The tang stamp dates this knife to 1989. 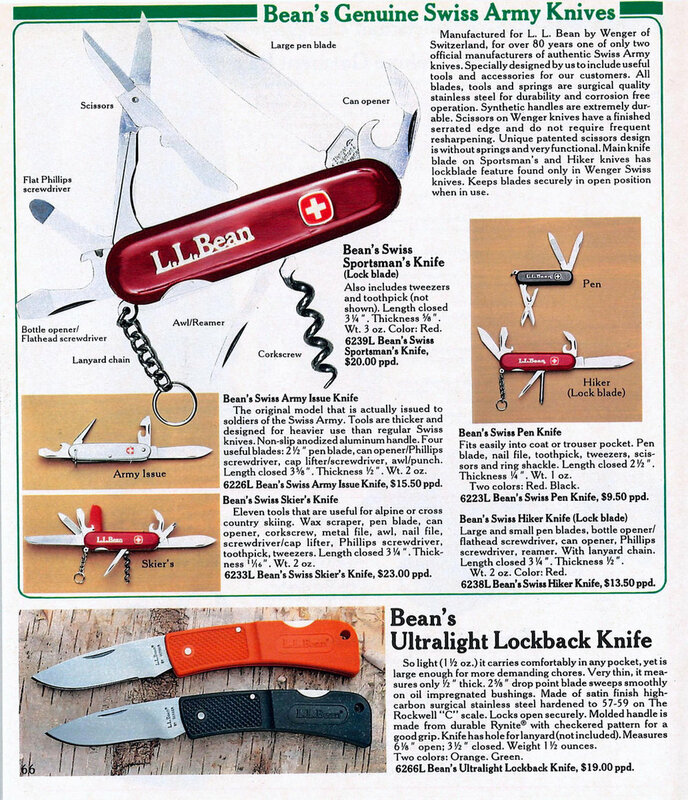 A page from LL Bean's 1987 catalog. Note the catalog number and price of the Wenger Standard Issue Soldier's knife. The original box with LL Bean catalog number. My last topic for this post will just touch on the modification of VSAKs. I am only a beginner, but I can report that it's quite fun and satisfying, and benefits from a thriving and helpful online community. After I bought a pair of vintage 84 mm Alox Cadets and realized that they were in a little rougher shape than I was anticipating, I resolved to teach myself the art of SAK modding and restore them both. I really liked the older shield & cross device and the honest wear and tear on their scales, but the main knife blades had both been drastically re-profiled (a nice word for essentially ruined, when it comes to folding knives anyway). The small knife blade on one was wrinkled and chipped from use and abuse, and the nail tool on the other had itself been modified into a letter opener. I kind of liked the letter opener mod so I decided to keep it, but the small knife blade on the other SAK had to go. The can openers and bottle openers on both knives were in ok shape given their age, but it made sense to me to replace them with new while I was at it anyway. So my plan was to basically replace the internal components and retain the vintage scales. Donor blades (left) and original, drastically re-profiled blades. Both pairs of blades used to be the same size! To put this into terms a watch collector can appreciate, imagine replacing a worn out movement on your vintage military watch with a new old stock unit, while retaining the case, dial, and handset. Your watch would be correct in every way (ignoring serial number issues, which don't apply to SAKs generally), have outward vintage charm and appeal, but with like-new internals. Just like a vintage watch, the resulting SAK is considered a put-together, and won't have collector value, but that doesn't diminish its utility and charisma. That was my idea -- brand new blades, implements, and springs on a knife with vintage scales; what could be better? Here is the process, in brief. First, the subject and donor knives are disassembled. The plastic scales on the donor knife pop off quite easily with any flat, knife-like tool. Then the rivet heads formed on the pins that are holding the knives together are drilled out. This is best done on a drill press using centering bits while holding the SAK in a vise. The pins can then be easily pushed out using an old drill bit or similar device as a drift. The last task for the old knife is to remove the cheapie "advertising" scales from a donor knife, the tools and implements of which were in unused condition. The rivet heads on the pins of the subject knife being drilled out. The rivet heads of the pins on the donor knife being drilled out. Note how the Cellidor-scaled knife uses a collar around the rivet head. This is what the Cellidor scale attaches to. Care must be taken to leave it undamaged for re-use. Using an old drill bit as a drift to drive out the pins. I used a 6-oz ball peen hammer for this work. Be ready, because when the last pin is removed nothing remains to contain the spring tension and the knife will literally fly apart. This leaves you with a small pile of parts and a what-have-I-done? feeling. If you've ever wondered how a Swiss Army Knife goes together, how they open and then fold back up with that characteristic snap, and why sometimes they are stiff or snapless, now is the time you find out. To reassemble the knife, I built an assembly jig that consists very simply of a small piece of wood into which I drilled small holes that corresponded exactly with the pin holes of the VSAK. Inserting new brass pin stock into the jig's holes allows the knife to be built up layer by layer. The top scale and first tool layer in place. First the top scale is placed face down on the jig, then the first layer of tools is added to it. Now the spring must be added, and this is where having the whole thing in a jig is a necessity. The spring must be pried into position, at which point it essentially locks the first two tools into place. Now the spring bar must be gently but forcefully levered in place. This locks the tools in position. Next the divider (or liner as it is more often known) is added, which is followed by the second layer of tools. This layer must now be locked into position by its own spring, and finally the bottom scale can be placed on top. The SAK is now essentially complete and the only thing that remains is to snip the three pins off very close to the scales and finish them up by peening them into rivet-like heads. This turns out to be the tricky part, and the most artful step of the whole process. The liner is added and tapped down, and then the key ring holder (on left end only) is added. The second layer tools are added and then locked in place with their spring. Note the customized letter opener implement on the left end of this VSAK. Finally the bottom scale is added and the assembled knife can be lifted off the jig. Before snipping and peening, the final assembly looks like this. After snipping the pins off and before peening them over. When it's finished, you have a very useful tool and a great feeling of having learned something new and created something useful. If you've mastered the art of rivet head forming, the blades and implements will have a nice snap to them. If, like me, you were a little too aggressive with your rivet forming, then the layers will be essentially a little too tightly packed and the knife's snap will be lazier because the whole thing is overly compressed. As I said, this is the art of the process, not the science, and like any art practice makes perfect. Et voilà! Vintage scales, new tools. This concludes Part 2 of my post on VSAK collecting. I welcome your comments below and thank you for reading! Sinn EZM 3 Fishes Lake Michigan!